Making the decision to pack your child’s lunch is extremely important to ensure that they are eating as healthy as possible. It can seem like a daunting task if you’re not used to doing it or if you’ve just run out of healthy packed lunch ideas. You don’t want to just throw in a basic sandwich and a bag of chips. You want to make sure that your child is getting a high amount of protein for strength, an appropriate amount of carbs for energy, and that it’s low in fats for health. Taking the extra time to make sure they’re having a healthy lunch is important for them to succeed during the school day. Below are six different healthy packed lunch ideas that are relatively simple to make and ensure their lunch is a well-balanced meal. Quesadillas are always a hit. When they are made with the right ingredients they have the potential to be one of the best super healthy packed lunch ideas. Use whole grain tortillas, low-fat cheese, and chicken breasts that will make this a great source of protein and carbohydrates. You can even add some avocado for extra healthy fats. 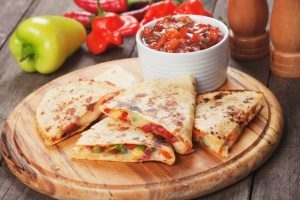 Quesadillas can be super quick to prepare in the morning by just utilizing your microwave to melt the cheese. Another bonus is that they can be served cold so you don’t have to stress about making sure they stay warm through the first half of the school day. Serve this with a side of fruits and vegetables and you’ve got yourself a great healthy lunch. Spring rolls are super fun to eat and have the possibility to be extremely versatile. Make them with rice paper or large lettuce to cut back on excess carbs. They can be filled with tofu, pork, shrimp, or chicken for needed protein. You can add anything else that your kid likes to make it customized especially for them. This can include ingredients like lettuce, tomatoes, avocado, and red bell peppers for their portion of vegetables. If your kid is a picky eater and doesn’t like vegetables, this can be a great way to sneak some into their diet without them even noticing! On the other hand, spring rolls can be a great option if your child is vegetarian. Serve them with a side of celery and peanut butter for the protein they need. Quinoa can often be overlooked, but it’s actually a great alternative for rice. It’s packed with protein and it’s wheat-free which practically makes this guilt-free. Mix meats, cheeses, veggies, and anything else with the quinoa and some balsamic dressing to make this a protein packed lunch. Don’t be afraid to take creative freedom here since quinoa can be used in so many ways. You could consider a quinoa burrito bowl or quinoa tuna salad, the possibilities are almost endless. Depending on what you add to the salad, pick out a side that offers another source of nutrition to make this the perfect lunch. Who doesn’t love pizza bites? Gooey, delicious pizza bites are always a huge favorite when it comes to kid lunches. However, store bought ones don’t offer the nutritional value that your kid needs to thrive. Instead, make them at home using cauliflower instead of bread to reduce the number of carbs. 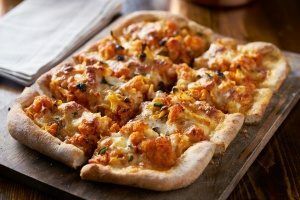 Choose low-fat cheese and organic tomato sauce to make this the healthiest pizza bite around. Add any topping your kid desires like extra cheese, pepperoni, or ham and pineapple. After having these healthy pizza bites, you’ll never even consider store bought ones again. Including a side of vegetables and a good source of protein will make this lunch a game changer. These twist on classic meatballs are a great way for your kid to get the protein and vegetables they need to succeed. Plus, they’re fun and easy to eat (which never hurts). This is another great option if your child is a picky eater because you can sneak some vegetables or other things in there that they wouldn’t normally eat. Serve with a side salad and some whole grain crackers to make this one of the most well-rounded healthy packed lunch ideas. Banana dog bites are your kid’s new favorite food, they just don’t know it yet. Take a whole grain tortilla, spread some Nutella, peanut butter, or almond butter on and add a banana. Cut up into dog size bites and you have a fantastic lunch on your hands. These are so delicious your kid won’t even realize they’re a healthy alternative and they’re sure to be begging for more! These great healthy packed lunch ideas aren’t just for your kids, they’re great for you as well! When you’re making them for your kid, why not make some extra for yourself? Everyone needs the appropriate amount of protein, carbs, and healthy fats, and that includes you! It’s important to take of your own health along with your kids because you want to make sure you’re setting a good example for them. Plus, why wouldn’t you make some of these for yourself when they’re so good? Whether you’re new to packing lunch for your kid, or your a pro who’s been doing it for years, everyone can benefit from using a bento lunch box to help keep everything fresh and organized. Bento lunch boxes come with dividers that make it easy to pack everything in one container without creating a big mess. This makes clean up easier for you and transporting it to school easier for your kid. Another way to be extra health conscious for your kid is to ensure that you’re choosing a BPA free bento lunch box. BPA is a chemical that is used to make varieties of plastics. When food or liquid is stored in these containers there’s a possibility that this toxic chemical can seep into them. BPA can cause many adverse health effects and can be especially dangerous to children’s brain development. Simply choosing a BPA free bento lunch box will eliminate this problem from your kid’s lunch!